She didn’t speak until the age of 6, silenced by the fear that her true self would not be accepted. For more than 20 years, Lucero Felicita Camarena felt a dissonance inside, assigned a gender that was incompatible with her internal sense of womanhood. 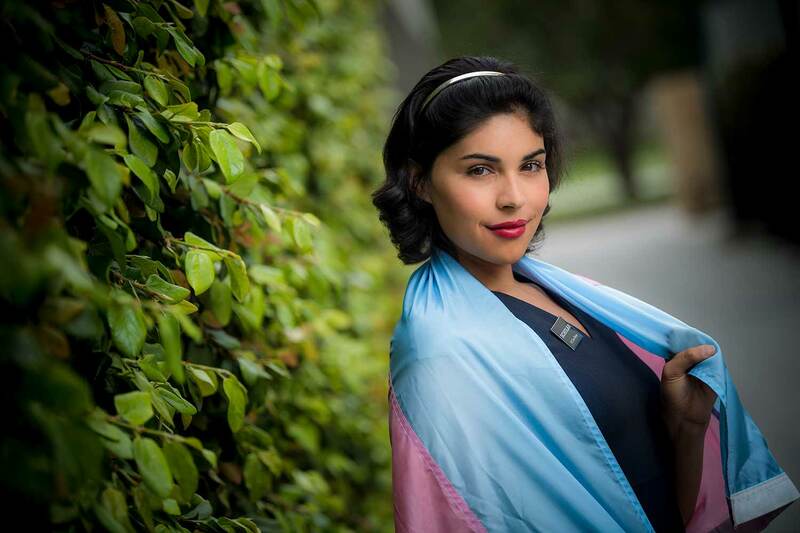 In her experience as a Mexican-American raised by a single mother in Turlock, Calif., Camarena was never exposed to representations of transgender identity. By sharing her story as UC San Diego’s All Campus Commencement student speaker, she hopes to inspire courage in others to channel their truth as a powerful form of social change. The All Campus Commencement celebration will be held at 9 a.m. on Saturday, June 16 at RIMAC Field. At the ceremony, Chancellor Pradeep K. Khosla will deliver the keynote address and officially confer degrees by academic division upon more than 8,000 graduates gathered as one student body from across campus. “I look forward to sharing my story, how I transformed my struggles into a triumphant passage to self-discovery,” Camarena said. In first grade, when other students were learning to read, Camarena was just beginning to find her voice. Socially isolated and behind academically, she was believed to be “a lost cause.” Without anyone to contest this belief, Camarena barely maintained a C average in her classes. It wasn’t until her high school counselor affirmed her potential that she began to succeed in her studies. But by then, it was too late. When it was time to apply to the University of California, she did not meet the requirements. Refusing to give up on her dream of studying medicine, Camarena attended another college for two years, excelling in her classes with nearly a 4.0 GPA. She reapplied to UC as a transfer student and was accepted to UC San Diego. This June, Camarena will be the first in her family to graduate from college. At the All Campus Commencement ceremony, she will share her story of resilience with peers in an effort to inspire them to live their own truth with conviction. As someone who actively challenges stigma and inequity, she seeks to empower the class of 2018 to become bridges of inclusion and support for those who are excluded by injustice. “My message to graduates is: take action by interrupting discrimination and exclusion, especially if you aren’t harmed directly by the impact, because complacency only communicates indifference to oppression,” she said. As a resident assistant (RA) at UC San Diego’s Marshall College, Camarena modeled what it means to be a conduit for inclusivity and critical dialogue. She was drawn to the college’s residential life philosophy of “Know yourself, Check yourself, Be yourself.” She served as a mentor for other RAs, co-leading a program on restorative justice that centered on deep self-reflection and fostering multicultural knowledge. Camarena explained that it was during this summer journey that she saw herself honestly and without shame for the first time, prompting her gender transition. After graduation, Camarena will pursue medical school to become a physician-scientist. Her ambition is to lead research in health disparities for communities of color and LGBTQ+ populations. During her time at UC San Diego, Camarena took part in research studies at the United States-Mexico border that investigated the risk factor for diabetes in a medically underserved population. She is passionate about improving health inequity and is interested in developing trans-affirming medical interventions. Reflecting on her college career, Camarena concluded that she “unlearned” many things. She has come to realize narratives that are inherited can be challenged. And rather than internalizing messages of unworthiness, there is much more power in activating your truth. “Despite fear and stigma and potential violence when people identify my gender nonconformity, I resist through speaking my truth in conditions when staying silent would be easier,” she said.